I’m a big fan of live music, but I also understand that there is a bit of a barrier. Unlike going to your favourite bar, live music is an ever-changing landscape. 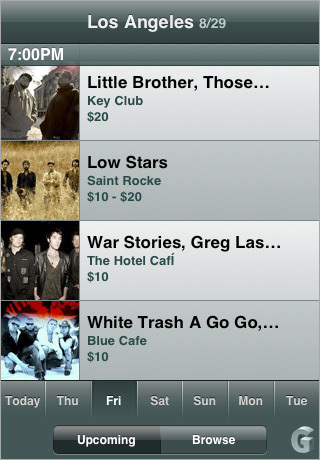 Two new iPhone apps for live music are working to make it easier. Gigotron, which won an award for best mobile app at SXSW Interactive, was originally only available for New York, LA, and San Francisco, but recently rolled out an update that includes Seattle. To be precise, it includes ‘Seattle-Tacoma,’ which I wouldn’t exactly consider one city. The listings are presented as a time-ordered list (based on doors, I presume). The information about the bands is pretty good, but not exhaustive, obviously; a quick check of Saturday night shows resulted in descriptions for The Gaslight Anthem, the Heartless Bastards, and local band The Whore Moans, but not for fellow locals Peter Parker. But the venue information is minimal, at best. Not only does it fail to specify city or neighborhood within Gigatron, but the ‘map this venue’ button seems to only send street address (not city) information to Google Maps, which means I ended up with locations in Skagit and Vancouver. Not good. Bandloop takes the opposite tack. Rather than focusing on artists, it focuses on your location, using the GPS info in the 3G iPhone to find you. Event information is presented as a map, and you can drill down for venue and artist information. The info page for each event includes the address of the venue, together with its website and the website of the artist. At the moment, it doeen’t seem to include Myspace pages, which means its easier to get information on more established bands. But I’m not really thrilled with having to go to artist websites to get any idea about their music, especially not on my phone. I much prefer Bandloop’s location-based interface, but would love it if it included in-line capsule descriptions like Gigotron. Both of these apps are solid betas, but I don’t think I’d want to rely on either of them to make my Saturday night plans.